Explain various factors affecting size of Apron. Draw neat sketch showing the basic parking configurations of aircrafts. Question: Explain various factors affecting size of Apron. Draw neat sketch showing the basic parking configurations of aircrafts. 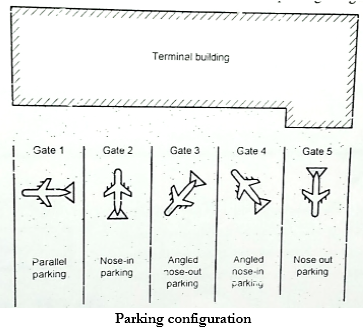 Position of gate is nothing but an aircraft parking area in front of or adjacent to terminal buildings. This parking space is used by a single aircraft for the purposes of loading and unloading of cargo, baggage and passengers. Predetermined hourly flow of aircraft should be easily and conveniently accommodated, hence determination of number of gates are essential. When the aircraft can be grouped with respect to the terminal building in various configurations or in various variety, then it is called as aircraft parking system or aircraft parking configuration.